Originally released only for the Famicom, Riki Kunio has now been translated and can be played on your NES. Note: This game was played on an NES 101 model (toploader) that was modified to output in AV composite (red, yellow, white) just like the original NES. It was connected to a 32-inch HD tv. Quick History: Nekketsu Kakutou Densetsu, translated as Hot Blooded Fighting Legend, and commonly referred to as Riki Kunio, was released for the Famicom (Japanese NES) in 1992. The game was never released outside of Japan, but today, the game has been translated and can be placed onto a NES cartridge for play on your Nintendo Entertainment System. Because the game is one of the many games in the Kunio-kun game series, its title for these NES translated reproduction cartridges is often simply ‘Riki Kunio,’ after the two main characters in the Kunio-kun series. 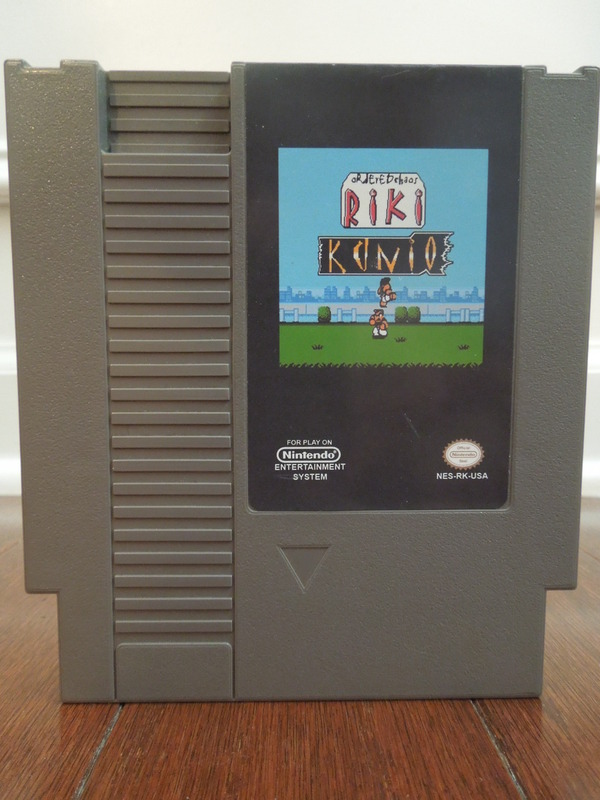 This review is for the NES translated reproduction cartridge, Riki Kunio. Players: The game is for 1 or 2 players, either competitive or co-op. Although the game actually has options for 3 or 4 players, this feature is inoperable, even with a NES Four-Score adapter and 4 controllers. I believe the only way to play with up to 4 players would be if you had the original Japanese game, a Famicom console, and the appropriate adapters and controllers. I’m unsure why this feature won’t work – perhaps the internal wiring of the Famicom and NES differ for more-than-2-player-gaming. 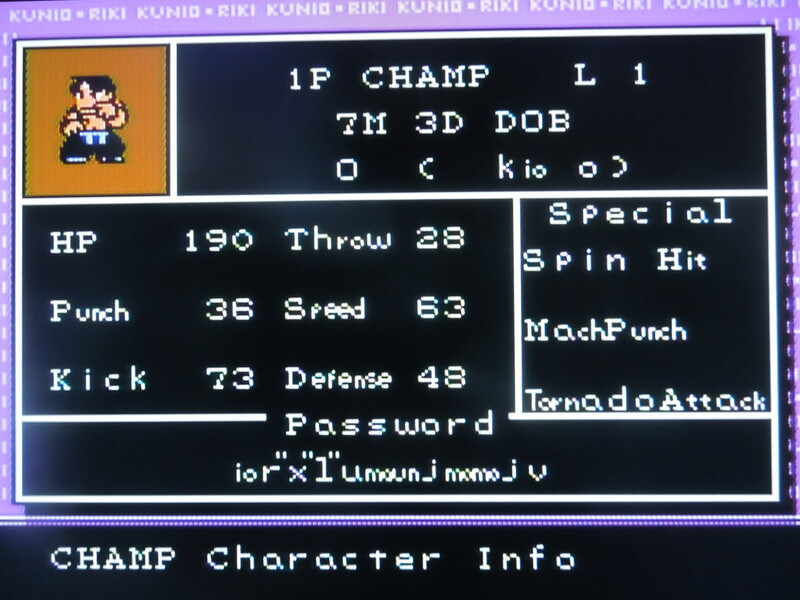 Password: Riki Kunio has a password feature, but unfortunately, it too is inoperable. It is a rather long password with unusual letters that would, in theory, save the ‘character’ you created or save your progress in Story Mode, but it won’t function at all in this NES reproduction cartridge. I can only speculate that when the game was translated from Japanese to English, the translators didn’t focus on this feature of the game, so the ‘password’ you’re given at certain points in the game doesn’t correspond to what the original Japanese characters (letters) were in the original Famicom game. Fortunately, not having a password in no way ruins the game experience. The ‘Double Tiger’ challenge Kunio; he accepts. Game on! 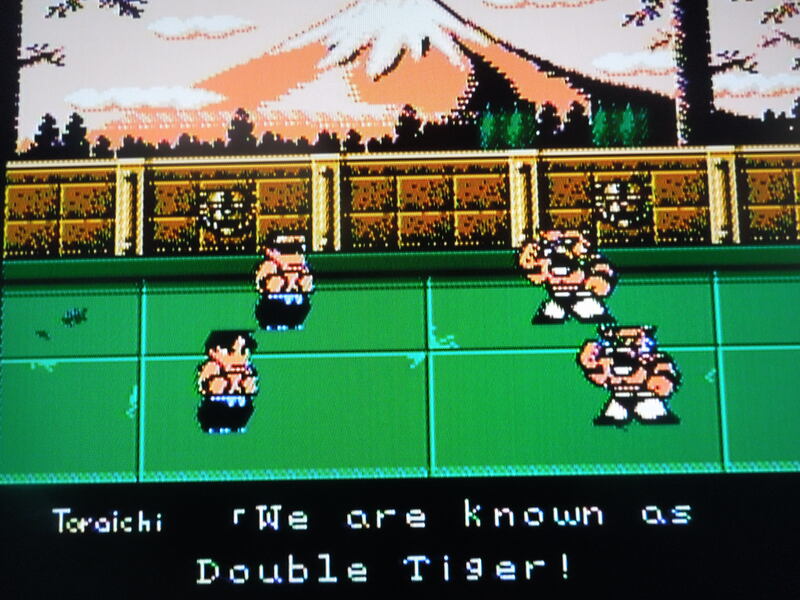 Story Mode: In Story Mode, the ‘Double Tiger’ put a note in the locker of Kunio, challenging him to a fighting tournament. 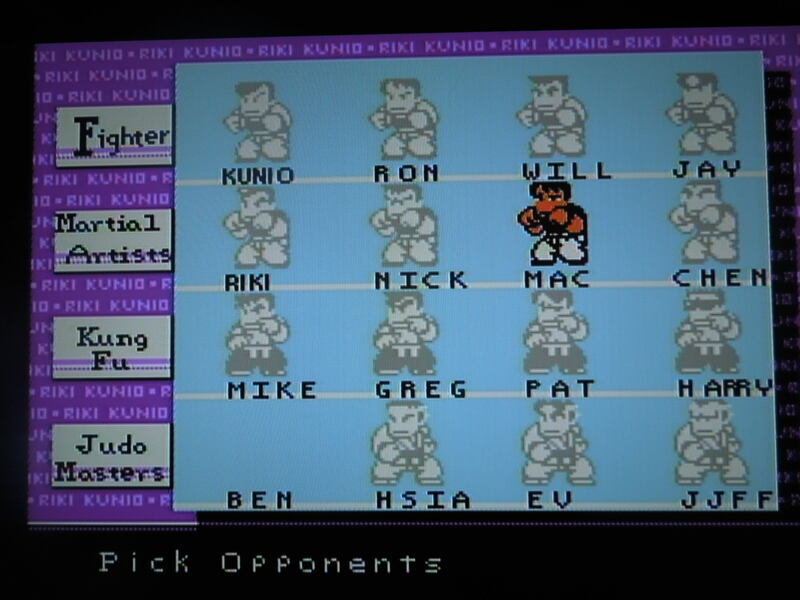 However, you create your own fighter in this game, instead of automatically being assigned to play as Kunio. First, you ‘build’ your own fighter by creating a name, giving a birthday, and even a blood type to him. Based on what you select, you’ll be given one of four types of fighters – Fighter, Martial Artists, Kung Fu, or Judo Masters. Each type has their own unique moves, and your created character will have his own unique stats – HP (Hit Points), Throw, Punch, Speed, Kick, Defense. If you play 2 player co-op, player 2 can then create his character, but if you’re playing alone, you can select your partner from among the 4 types of fighters. You can then select the ‘rules’ for your fighting matches, but honestly, I haven’t noticed any real differences in gameplay based on this option – I find selecting ‘No Rules’ to simply be a good default selection. Now, you and your partner will enter a 2 on 2 fighting tournament that includes 7 other 2 man teams. The game keeps up with your wins and losses, and after winning a set number of fights (I had to play 18 fights, having won 12) before finally getting to fight the Double Tiger. After every match you win (and sometimes even when you lose) you and your partner will gain ‘levels’ (you start the game at Level 1). With every level you gain, your stats go up and you get stronger. You win matches when you and your partner defeat both of your opponents (drain their energy bars to beat them). Both you and your partner have to be defeated before you lose the match. Note: You can strike your partner, so be careful. Build your own fighter, who will have his own unique fighting style and statistics. Rumble Mode: In Rumble Mode, 1 or 2 players can compete in a 4-man free-for-all fight (the other fighters will be CPU). The last man standing wins. You can select the arena you fight in from 7 selections, including a waterfall arena, a huge freezer, and a factory with electric walls. Each arena has hazards, like spikes, electricity, disappearing bridges, and conveyer belts. There are 4 types of fighters you can select as your partner (in 1 player Story) or as your opponents in Rumble Mode. Control: B kicks. A punches. A + B jumps. Toward, Toward makes your character run. Depending on which character you’ve ‘created’ – Fighter, Martial Artists, Kung Fu, or Judo Masters – your character will have different moves. There’s a detailed FAQ of moves online, but here are some interesting points to this fighting game (that you can honestly execute by simply ‘button mashing’ often). You can kick opponents while they’re down or mount them and punch them in the face (press A near them). You can pick up a downed opponent and throw him with A. You can execute wrestling moves like neckbreakers, backbreakers, power bombs, and pile drivers. 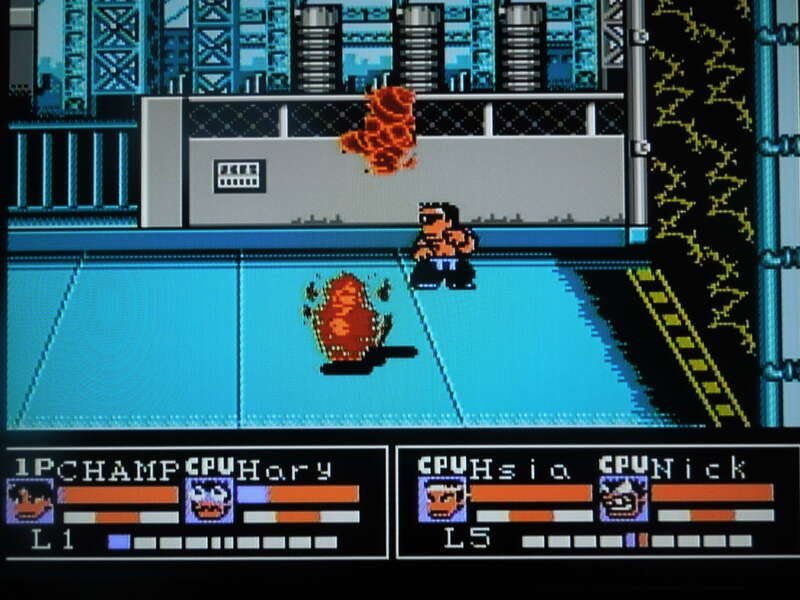 Also, you (and the CPU) can execute double-team moves, like turning into a fireball and attacking the opposition. Food: When a fighter is defeated, he turns into food, like a bowl of noodles, which can be eaten by any of the remaining fighters to replenish some of their health. Music: The music is quite catchy, and it changes based on the arena you’re in. 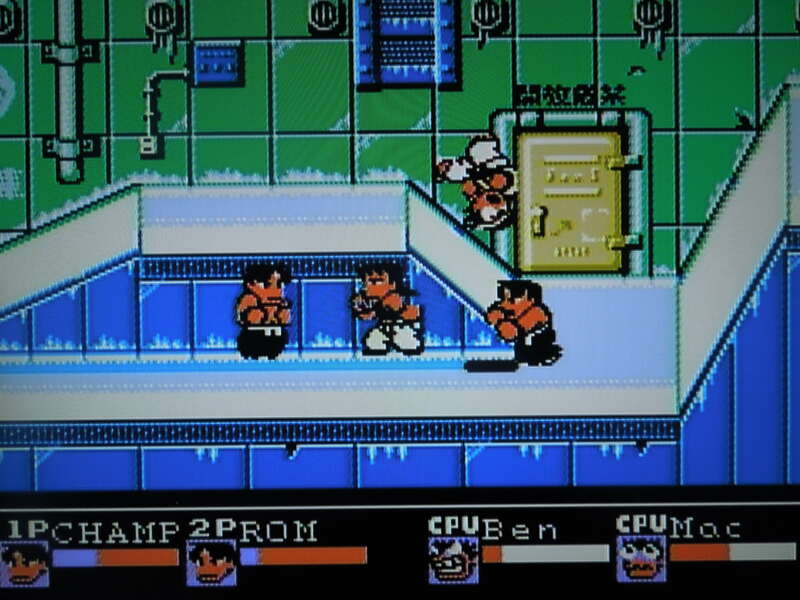 The punches, kicks, throws, and slams all sound terrific for an NES game, too. So, where can I find this game? You can find the original Japanese Famicom game on eBay, or you can request (or perhaps find a site selling it) the NES translated reproduction cartridge. You can also play the rom on your computer. Team Super Moves cause great damage. 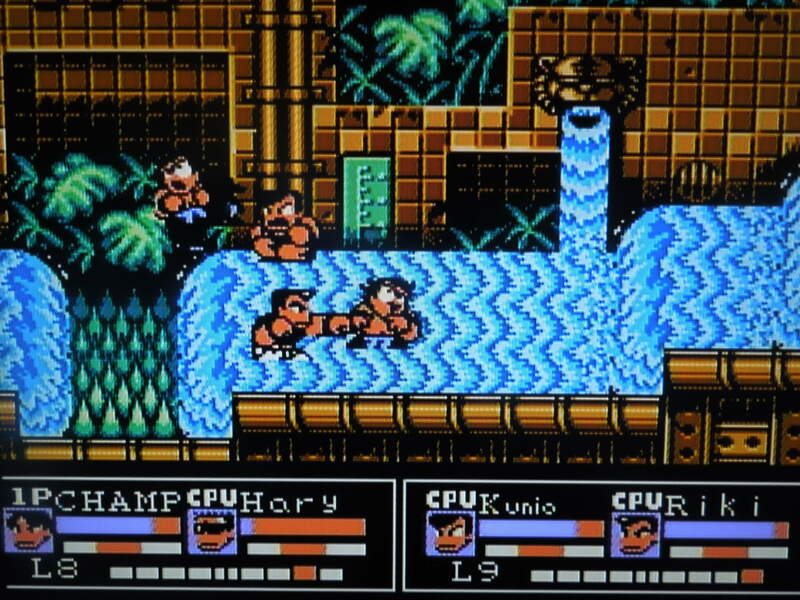 Conclusion: Riki Kunio is unlike any NES game I’ve ever played. The moves and play-style remind me of games like the popular Beat ‘Em Up, Double Dragon, for the NES, but the fact that the game is a VS Figther, and a co-op VS Fighter makes this game special. I’m not absolutely certain, but I don’t think there’s anything else like this on the NES. The game control is great, and there is no slow-down at all. 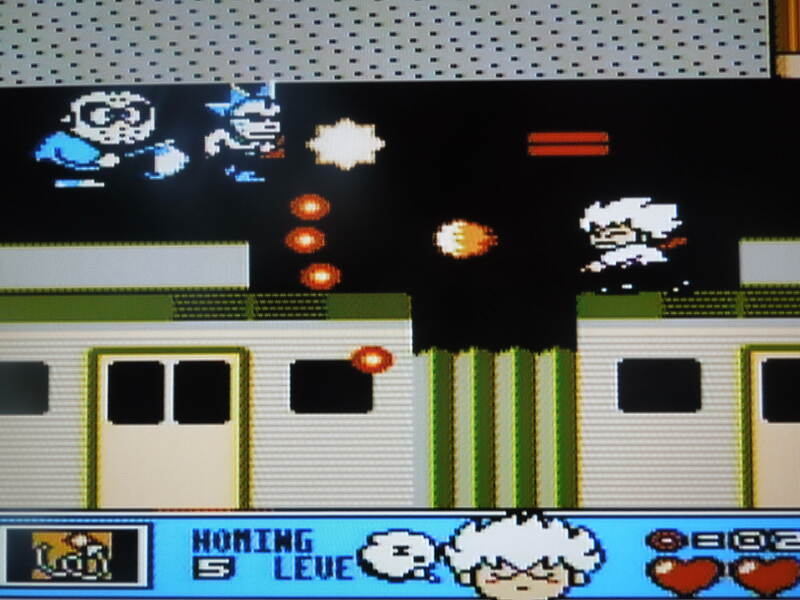 The game does flicker when big moves occur, but this is nothing terrible, and is much worse in games like Super Dodge Ball, another Kunio-kun game. With all 4 characters running around on screen, it can be easy to lose track of your character, however. Fortunately, both you and your partner (in Story Mode) where one color (like purple or green) while your opponents wear a different color. While the game seems to be a ‘button masher,’ there is some strategy in trying to evade the opposition or double-teaming an isolated opponent. The challenge of the game is just about right, with the Double Tiger, the opponents in game’s final match, being tough, but not impossible. The translation is not 100% perfect, but it’s mostly complete and easy to follow. After playing approximately 16-20 matches (and winning more than you lose), you’ll be ready for the Double Tiger. Probably a 1 of a kind fighting game for the NES. Absolutely worth checking out. 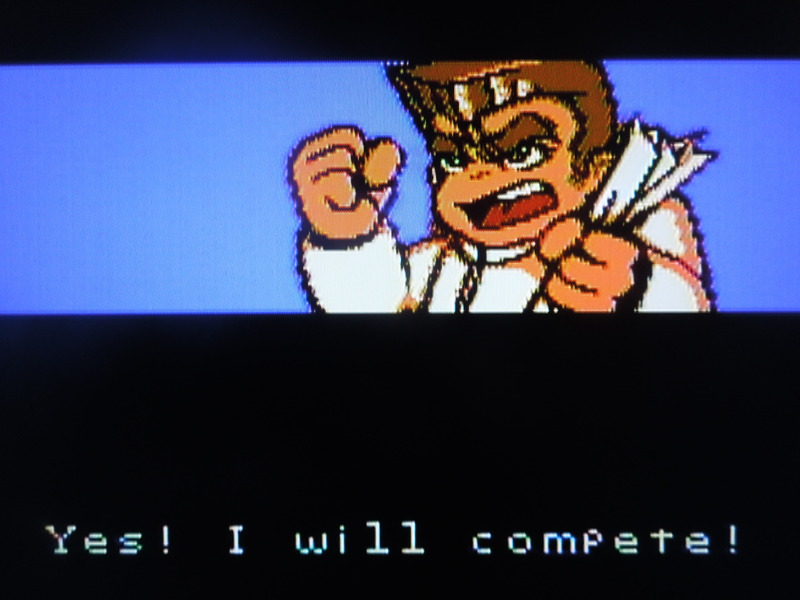 This entry was posted in NES - Nekketsu Riki Kunio and tagged Nekketsu Kakutou Densetsu (Riki Kunio) Review. Bookmark the permalink.